Thanks to my blogging/read along friend Amy of My Friend Amy for once again hosting the Fall Festival Recipe Exchange. Last year I submitted pumpkin french toast and pumpkin soup. This year, it is my famous pumpkin vegan chili! I make this all through the fall and winter, but it is ALWAYS served on Halloween night accompanied by corn bread and orange jello. You can easily make it carnivorous by using ground beef, but the bulgur gives it a rich, earthy, flavor. 1. Prepare bulgur according to package directions. 2. Meanwhile, heat oil in a large nonstick skillet. Add onion and pepper; sauté 5 minutes. Add chili seasoning; sauté until fragrant. 3. Add 2 1/2 cups water, the tomatoes, pumpkin, zucchini; bring to a boil over medium-high heat. Reduce heat and simmer 10 minutes, stirring occasionally, until vegetables are tender.4. Stir in beans, corn and bulgur; heat through. Remove from heat and stir in cilantro. Oh chilli is always a big hit at my house and this sounds like a yummy spin! Hi Melissa - Are you a vegan? I am and love the Vegan Pumpkin Chili! Your friend from years ago (Gable & Gotwals)! This sounds wonderful! Have you ever made it without the pumpkin? My husband doesn't like pumpkin (as totally weird and irrational as that is!) but I think I could talk him into the rest of it! Hi!!! Alas, I am not a vegan, but one of my very best friends is, so I keep a handful of recipes that I can serve him. I guarantee he won't be able to taste the pumpkin! It isn't even orange! It just makes it thick and saucy. But, yes, I have made it without the pumpkin and it is still good. 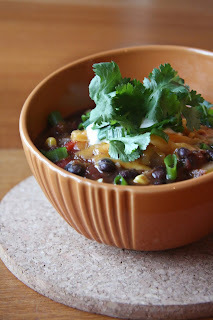 What are the chances that I just posted about making chili this weekend and you most this recipe. I haven't thought to add pumpkin to chili but I might try this! I need to pop over to My Friend Amy's site to read more recipes. Love this pumpkin theme. Will have to give this a try for son who is a vegetarian. Thanks. Wow! This sounds really delicious. I would have never thought to put chili and pumpkin together! We do this too! It's so fun to taste so many great dishes and get the recipes too! This looks so good - I want to eat more vegan and healthful food choices. Ok, I just found and read your mother daugher book club posts from the past! It seems they have enjoyed the older books (Nancy Drew, Macy-Tacy whatever it's called) more than the newer releases. Huh!